MindMapIt is not exactly overloaded with features, and it's stupidly simple in use. 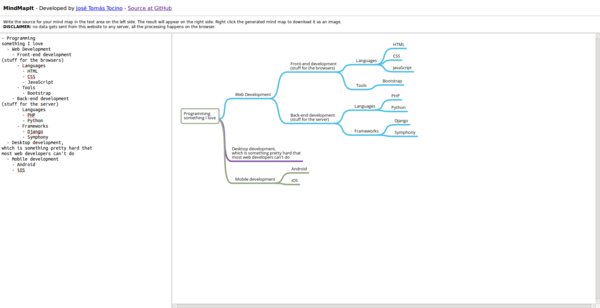 Write an outline in the left sidebar, and the application automatically generates a mindmap in the main pane. To save the mindmap as a PNG image, right-click on it and choose Save Image As. That's all there is to it. Obviously, MindMapIt is no match for full-featured mindmapping applications, but it can come in handy when you need to whip up a simple mindmap with a minimum of effort.